This show was broadcast live on CKLG-FM. Recordings are sometimes incorrectly labelled as May 22. The band now begin the show with a tape of the as-of-yet unreleased Charmonium done up by Terry. Gary plays along with it behind a curtain, until they launch into their first proper song. They'd begin the show this way through early 1979, when the full Charmonium would be written and added to the set. Kim's joke in Toronto Tontos is now aimed at Anita Bryant. On this tour the first verse of Waterline is actually a playback of the album version (this is also the case in Hamilton a couple weeks later). Upon McCracken's entry, the song continues as normal. Coming Off The Moon now has a coda, much of which seems to be lifted from Frank Zappa's later live arrangement of the Yellow Snow Suite. The song would be performed this way until the band's breakup in 1981 (here's an example of Max doing it in 1980). These photos are from one of the four shows in British Columbia on this tour. "We're all here to be reckless. For celebration. The madcap scene, the Max machine" — Max Webster. 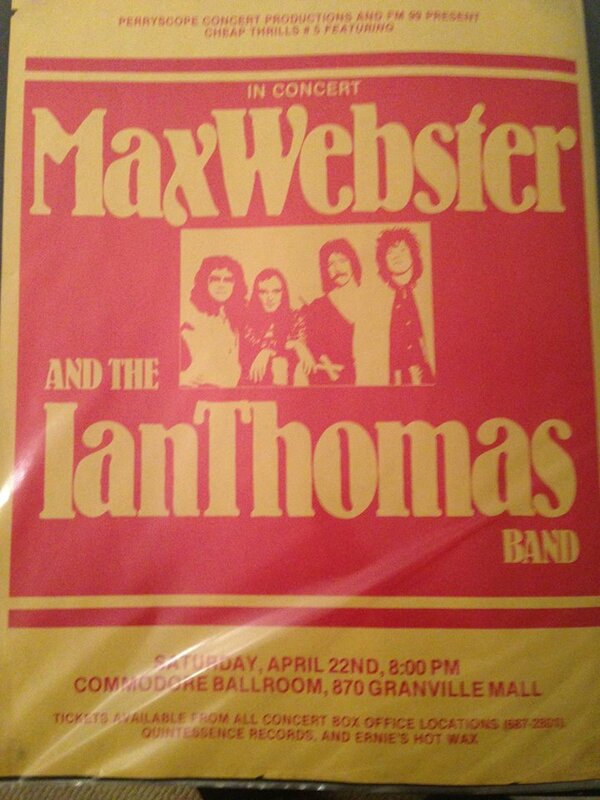 The Max machine, the one that made that quote, is a Toronto rock band named Max Webster, and the celebration was its concert at the Commodore Ballroom Saturday night. And madcap and reckless it was. Max Webster is shaping up as the country's most unusual band, with a combination of outlandish lyrics and superheated rock. Vancouver has up to now been unfamiliar with the group, but Saturday's live action should help change that. The show was in fact double live, as the sold-out proceedings were broadcast simultaneously over FM 99, a first for the city's major FM rock station. The bade it one of the musical events of the year, locally, as if Max Mabster's debut as a headliner wasn't enough for notoriety. Max Webster is weird you see, though in a crafty sort of way. To begin with there is no one in the line-up named Max Webster, and no one anywhere else named that either, at least as far as those in charge are concerned. That is not so surprising when you get to the song lyrics, which are mostly the product of the group's post-in-residence, Pye Dubois. Dubois, who appears to have only the most tenuous connections to reality, writes things like this: "Two thousands years we crossed up Jesus thinking he'd make ends meets. Christ no, you can't make the world to order, like a hotel services food." Or this: "A foot in the kitchen, a foot in the door, but the foot in your mouth is so you don't get bored." In keeping with his obvious fear of the universe, Dubois does not actually perform with Max Webster. Public appearances and the making of Max Webster albums, like the latest Mutiny Up My Sleeve, is left up to four other people: Terry Watkinson, keyboards; Gary McCracken, drums; Dave Myles, bass; and Kim Mitchell, guitars. Mitchell is the leader, writing most of the music and handling much of the singing. He is also unusual. Here is this long-haired stringbean, six-foot-two, 120 pounds, dressed in preposterous rights and vest, looking like he just came from a Salvation Army Sale on the planet Saturn. But for an hour or more he is also the hardest working man in the country, gyrating, cajoling, chording, and flailing — pushing the music, pushing the band and audience father than either appeared willing to go. "Now, I want a chant," commands Mitchell, at the beginning of the Party, a song that provided the quote that began this review. He gets his chant, from a crowd primed for action: "Cat's in the bag, the neighbours holler, this party is higher than the Eiffel Tower". Not quite that high, but Max Webster is getting there — by laying down a distinctive, unforgettable style without straying too far from the rock mainbeat. 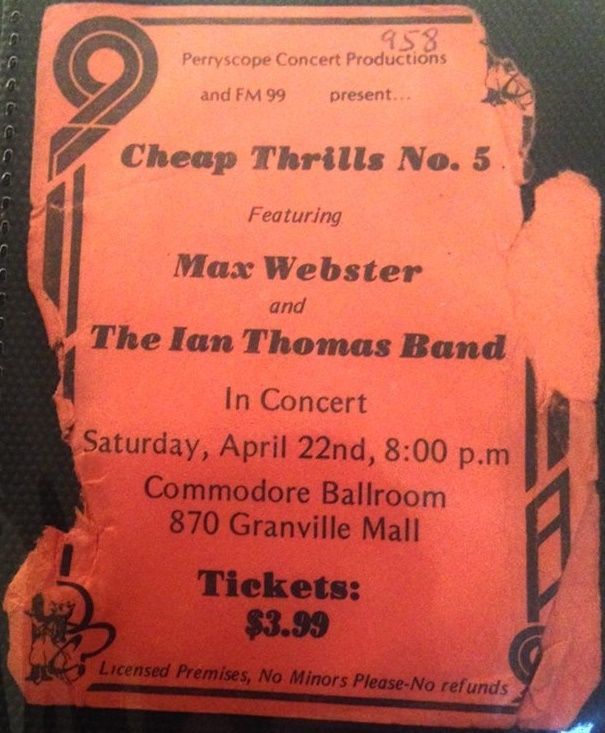 If anything else were needed to sell the show, fifth in the highly-successful Cheap Thrill series, the $3.99 admission bought an opening set by the Ian Thomas Band, another topnotch unit from Ontario. The Thomas band no doubt made a big contribution to the sellout, as the former symphony arranger and radio producer has had several hit singles, including the current Coming Home from his latest and best album, Still Here. Having been considerably put off by junk like Painted Ladies from the earlier days of the Thomas career, I was considerably impressed by his tight little band. The clear, soaring Coming Home is no fluke, even if it does sound like Elton John, and the band is equally adept at the more frequent rock tunes.